How to address ‘Exit Strategy’ in your Business Plan? I am often asked what text should be included in an investor ready business plan under the section ‘Exit Strategy’. This is to answer the question for the investor, ‘How will we get our money back’. My general view on Exit Strategy is that it is a very difficult issue to answer properly because it is very difficult to forsee the future and each investor will have their own interpretation of the ‘correct’ answer. But there are options open that must be analysed within the context of your business and industry so that a credible discussion can take place such that your potential investor has confidence in the abilities and ambition of your team. This blogpost will tackle the ‘Exit’ issue from the perspective of a startup based in Ireland (while the new section at the end references an article which details how Facebook was funded from concept to IPO). • Angel Investors … wealthy individuals who invest in early stage ventures (possibly looking for some personal involvement in the business). • Venture Capitalists … invest the capital of third-party investors in enterprises that are too risky for standard capital markets or bank loans. When applying to or negotiating with the various sources of funding it is important to understand the viewpoint of the other party. I recently (July 2014) attended a very good InterTrade Ireland Business Plan workshop day in Galway which featured Equity Investment Expert Drew O’Sullivan. 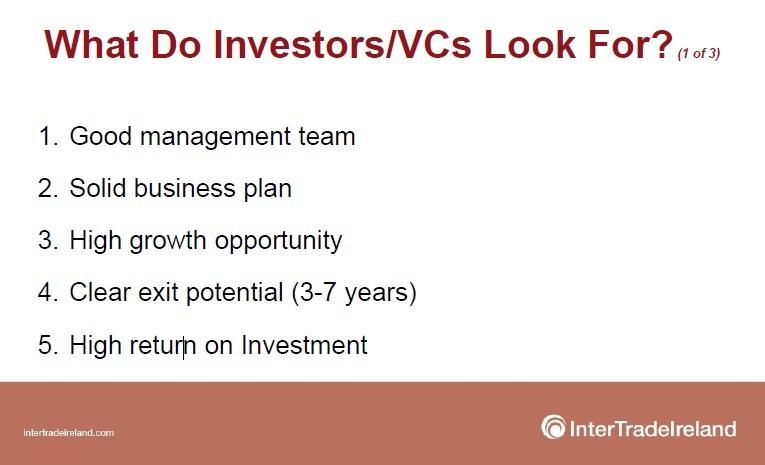 The fourth factor listed (not in rank order) was Clear exit potential being strong potential to exit before end of funding cycle of the VC who generally raise money in 8 to 10 year tranches. It is generally acknowledged that Management Team and Exit opportunity are the two most important factors. I am often asked, ‘Can a startup raise equity investment and not do an exit, i.e. just manage the business indefinitely’. The short answer is No. There is a brilliant video by Seth Godin in which he talks about a lot of things to include dealing with Investors and Exits, whereby he says that you have already agreed to sell your entire company when you raise one dollar of investment. It is the second of the videos in this blog and both are definitely worth watching. The business is sold as a ‘going concern’ to another player in the market possibly a bigger competitor. But in your business plan you can not just list Trade Sale. Detail needs to be provided on potential buyers outlining their track record of purchasing businesses. The trade sale option is generally seen as the most likely option in Ireland. [BTW, Ireland Inc. has an issue in that few of our startups get to global status because the tendency is to sell the business after maybe ten years before a real global breakthrough can be achieved]. Kentz Engineering is a positive example of an Irish company which has acquired many companies internationally. Stockbyte, the image library and Kerry based startup is a classic example of a startup which was sold – by Jerry Kennelly in 2006 to Getty Images for €135m. In July 2014, Nasdaq listed Thoratec Corporation, purchased Apica Cardiovascular, a US medical device startup based in Galway, for US$35 million with potential for a further US$40 million when sales and clinical trial milestones are achieved. The Enterprise Ireland case study adds that since coming to Galway, Apica has raised €3.75 million in funding from Irish VC Seroba Kernel Life Sciences, Enterprise Ireland and Triventures, a specialist medical devices investor based in Israel. This is not an area I know a lot about but I was very interested to hear the CEO of Version One talk about their preferred exit option in maybe 6-8 years being an IPO. They have just raised €8 million from BDO Development Capital Fund as per this article on Silicon Republic. He also talked about the possibility of replacing the current investor with a new one. Overall they have a €16 million available as they have also secured €8 million of debt financing. (and it is interesting that the target market is Ireland and the UK and the route to market is by acquisition or trade purchases of competitors). Generally IPOs are for big companies – for example CPL listed on Irish Stock Exchange had revenue of €330 million in 2013 with a €11.7 million profit before tax. Significant money is raised and cost a lot of money to arrange. VCs particularly the Seed VCs in Ireland like Kernel, Delta and Enterprise Equity (ie those who make investments at early stages to the value of €500,000) will retain funds for follow on investments. Round 2 funding will most likely be done in partnerships with other larger VCs including some based internationally. At a future funding round the original investors will look to divest when their ROI objectives have been achieved and they can secure their 10x return. In general VCs are not in favour of planning a scenario where their stake is bought back by the original team at a point into the future but it does happen in reality – this is effectively like setting up a loan arrangement and would not provide the return required. Angel Investors may plan for such a scenario particularly where they avail of the Employment Investment Incentive (EII) a tax relief incentive scheme that provides tax relief for investment in certain corporate trades – replacement scheme for the Business Expansion Scheme (BES). Not all businesses succeed! In the scenario of a ‘bad investment’ the business is liquidated. It is part of the game and is to be expected! I recently wrote two articles on Finance for Startups in Ireland. The second one dealt with the Equity Investment landscape in Ireland with a key conclusion being that only a minority of businesses are relevant to VCs – it accounts for only 5.6% of SME finance (because few companies have the five elements required as identified by InterTrade Ireland). For those seeking Angel or VC investment, there is no option but to become immersed in financial calculations in the area of Company Valuation and Exit Opportunity based on Market Opportunity. Venture Capital Organisations operate on a High Risk/ High Return Model. They generally operate a “2 & 20” arrangement whereby they receive 2% of the Fund raised from their Investors as a Fund Management Fee and 20% Carry being 20% of the return earned for investors. So it is directly in their interest to pick a portfolio of investment opportunities that optimise (as opposed to maximise) their earning potential. They will be looking for 10 Times Investment as a Return. This is on basis that not all investments will work out so a ‘winner’ will be needed to cover losses on other investments. What is the likely value of your business in 5 years? Nobody likes answering the question in a job interview, ‘Where do you see yourself in 5 years time?’ but you have to find a convincing answer. In the investment scenario, the question is equally profound and reveals the ambition and credibility of the team and proposition. The first issue is determining the value of the business now. This is generally referred to as ‘Pre-Money’ valuation which is before external equity investment is secured. It will be agreed with the investor through negotiation as it influences the percentage equity that the investor will receive. There is a neat mathematical example provided by Investopedia outlining Pre and Post Money. • Let’s say for example that a business receives €500,000 for 20% of the business. The Post Money Valuation is now €2.5 million. • The VC will require a 10 X Return. • This means that the VC believes that with the investment that they provide and the action plan that can be implemented by the current management team (with additions) will result in company growth such that their stake in the company will increase in value to €5 million being 20% of a total valuation of €25 million for the business. This would be within a time period of say 6 years. 1• The business could be involved in a Trade Sale. Every industry is different but taking a prudent calculation of 5 Times Annual Profits (before interest and tax), a competitor could buy the company for €25 million if EBITA was €5 million. This is referred to as X Times EBITA (Earnings before Interest and Tax). But in some industries the X can be as high as 12 or 15 as it is a matter of negotiation according to the perceived value of the company. So how much Sales do you need to achieve EBITA of €5 million. Again it depends by industry. A mature organisation such has Tesco has a declared EBITDA of 4.52 bn on Sales of 63.5 billion or 4.7%. So Sales is 20 times Profits. Growth oriented Startups might enjoy a stronger net profit margin so the factor to use in multiplying Sales range from 15 to 10 or maybe a bit lower (lower being better in this instance). But be careful projecting high profit margins as your numbers must be realistic (believable to your audience). A net profit margin for a good solid business would be about 3- 5% and you need to be a special company to be achieving better than that. Returning again to CPL, the recruitment agency which reported its financial highlights in 2013 as €330 million revenue with €11.7 profit. Fantastic results that work out at 3.5%. My final example is Irish Pride which was bought earlier this year. According to Business Plus (great magazine) the bakery with turnover of €51 million was on the market for 2 years, with press reports indicating a transaction value of €6 million plus possibly another €2 million depending on how the company fares under new ownership. Apparently the original price to the market was €17 million – it is all down to negotiation and perception of value. Getting back on track, say your startup has 10% net profit margin, and you need to make profits of €5 million, then Sales need to be 10 times or €50 million. • The key issue here is how likely or believable it is that the company will achieve €50 million in Sales. This is a view taken by the investor and explains why Management Team and Market Opportunity are critical to evaluating exit potential. I don’t intend to talk about Management Team. Market Opportunity is interesting as this means that the business would need to be targeting a market which is at least €500 million so that within five years, the projection of €50 million Sales equates to at most 10% market share and there remains plenty of room to grow. Ideally the ‘target addressable market’ would be €1-2 bn and growing – sizeable enough that company can stake a sustainable position in the market and will not be ‘crushed’ by the competition. 2• A larger investment group could buy the 20% stake for €25 million. 3• Not wishing to complicate matters, but the above scenarios 1 and 2 are somewhat unlikely in Ireland as Round 2 funding will probably be required in say years 3-5 and this will result in dilution of the shareholding of the existing shareholders. In the above example the business may take on investment of 2 million for 20% of the business. This now values the company at €10 million. The original VC investor’s stake is diluted to 16% and it is now valued at €1.6 million [500k invested initially]. For the record the original founder who started with 100% and reduced to 80% in round one is now down to 64%. VC One may decide to increase its investment as part of Round 2 to increase the funds available and to retain its full stake. This could be priced at a slightly discounted rate. The Post money valuation would reflect this investment. Other contractual items may be included in a Shareholders Agreement such as ‘Racket Back’ mechanism whereby the VCs gives back some equity on hitting revenue milestones; vesting or cliff agreements whereby founding team’s equity is reduced pro rata if they leave within the first two years. The EXIT OPTIONS for VC Two, probably within a 5 year time timeframe, remain the same: divest to another VC, IPO or Trade Sale. Again they would be looking for 10X Return, at a much larger deal size. 1• The business could be involved in a Trade Sale. Again taking a prudent figure of 5 Times Annual Profits, a competitor could buy the company for €100 million if EBITA was €20 million (above I noted that the X in the multiplier could be 10 or higher. What happens in practice is that a company will run its business and its financials in a certain fashion for maybe 3 years to make it attractive for a trade sale). • The key issue here is how likely or believable it is that the company will achieve the required €200 million in Sales (assume 10% net profit margin so Sales is ten times the target €20 million). A target addressable market of €2-4 bn billion and growing would need to be identified. This could include expansion into new verticals and new markets. • If Round 2 happens in Year 3, and exit is achieved in Year 8, VC One will have enjoyed a 32X return within 8 years. But a lot of hard work is involved in making those numbers! The Exit Strategy will be mentioned in your business plan in tandem with your financials. So in the Executive Summary you will be mentioning how much money is needed by the business and what those funds will be allocated towards. It will also reference the financial projections providing an ideal time to include a one liner on the Exit Strategy. Later in the plan, a fairly detailed action plan with budgeted costs will be presented in the Finance section. A subsection can be added with the specific title of Exit Strategy. In terms of telling the story of the business and its growth roadmap, this would fit neatly along with a subsection titled ‘Future Growth Opportunities’. I always suggest that a template be used to structure the business plan and that this is tailored to your specific business. As such as long as there is a specific Section or subsection called Exit Strategy, it can be placed wherever it fits in terms of getting the message across. If you are seeking equity investment I am assuming that your investor ready business plan highlights that you have: a brilliant product; have achieved market traction; have strong reference customers; have a credible and working business model to include routes to market and partners; and a superb team. You will also need a credible exit strategy which is based on understanding the size of the market opportunity and presenting robust and ambitious financial projections. For startups the most likely Exit option is a Trade Sale so evidence will need to be presented as to likely suitors and track record of such transactions in the industry. In April 2017 I read a fantastic mega post by Martin Luenendonk the startup fundraising strategist behind RoadToFunding.com entitled The Definitive Startup Funding Guide which includes a step by step investment explanation at each stage of the funding and growth journey. The article is worth checking out – the information on Facebook is very interesting indeed (sample below). The start of 2011, witnesses a Private equity-led round, during which Goldman Sachs and DST Global provide $1.5 billion in fresh capital. 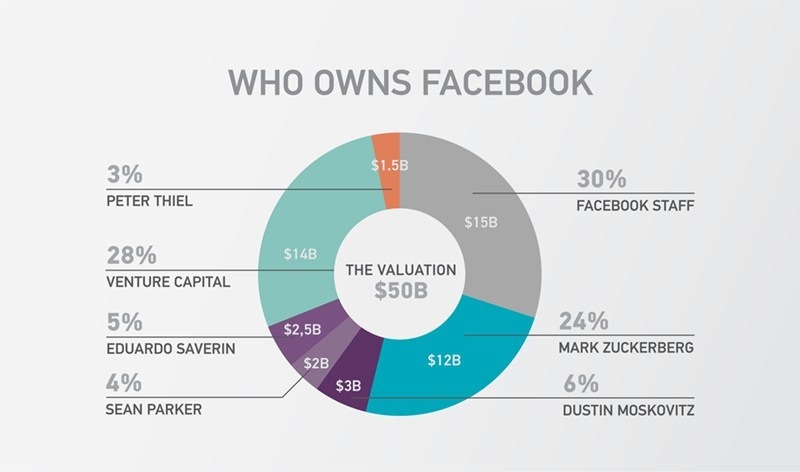 The article (free to download pdf format available) also presents the post IPO pie chart for Facebook.